Yellowtail—hamachi—is a popular fish for both sushi and sashimi. Megu Restaurant. 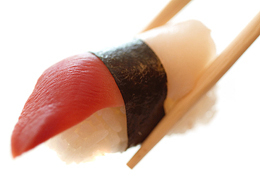 If you enjoy this Sushi Glossary, we have a food glossary for almost every category of food. Check out the Seafood Glossary, too. A type of oshi sushi (pressed sushi) made using a wooden rectangular mold. It is the best-known style of pressed sushi, which originated in Osaka. Ric is pressed into the mold lightly, toppings are overlaid, and the “cake” is cut into squares or rectangles. See oshi sushi. 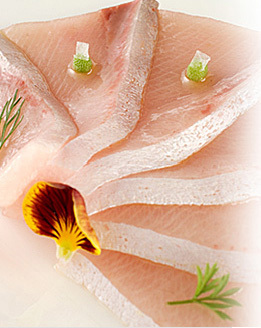 Hamachi (photo above), or young yellowtail, is a gleaming, unctuous, firm, pink-hued fish, one of the more flavorful. 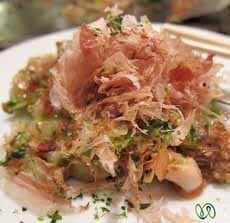 Often served chopped in a roll with with scallions (negi-hamachi). Hamachi is called by different names, depending on its maturity. Older hamachi is referred to as amberjack. Yellowtail collars, generally served broiled. A type of Japanese clam, in season in March. A trompe l’oeil style of sushi where egg crêpes are folded into quarters and stuffed with sushi rice and any variety of flavoring ingredients (sesame seeds, ikura, parsley, etc.) The finished product resembles a clam shell (photo at right). Hamagari-zushi is related to chakin-zushi, where the omelette is wrapped in a bag shape and tied like a beggar’s purse. 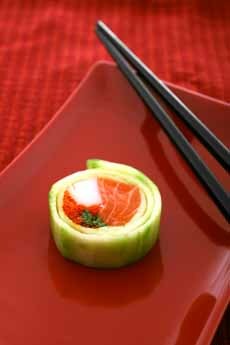 Hamaguri-zushi (photo courtesy Just Hungry). This is dried bonito, shaved or flaked; good, but not the top of the line (katsuobushi). The process for creating the flakes is complex: Fillets are simmered, deboned, smoked and smoked again the following day. They are not katsuobushi, which goes through a final fermentation stage, but are a good substitute at a lower price, called aragatsuo. They are sold shaved and packaged as katsuo-kezuri-bushi or hanakatsuo. Hankatsuo, dried bonito. Photo courtesy Uncornered Market. Rice and fish or vegetables rolled in a sheet of nori, resembling an ice cream cone. Hand rolls are best eaten when sitting at a sushi bar, so the nori remains crisp. If it takes a few minutes to get to a table, it it picks up moisture from the ingredients and becomes chewy, losing the texture and flavor it should have. Also see temaki. Thin, transparent noodles made of bean gelatin. They are also known as bean thread noodles, bean threads, cellophane noodles, Chinese vermicelli, crystal noodles and glass noodles. They are made from a starch such as batata starch, canna, cassava, mung bean starch, potato or yam starch, plus water. In China, mung bean starch is used. Bonus: All these noodles are gluten free. 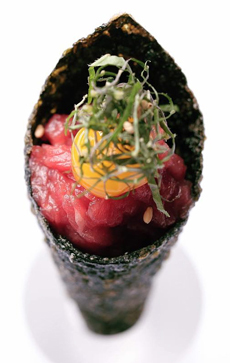 A maguro (tuna) hand roll with a quail egg (uzuri tamago), scallions and sesame. Photo courtesy Jungsik. Chopsticks. Hashi is the Japanese word for bridge (those picturesque Japanese footbridges). Much Chinese cuisine is cut-up and wok-based, while the Japanese eat a lot of whole fish, and the tapered ends facilitate the removal of bones. Chopsticks are the world’s second-most-used method of bringing food to the mouth, after fingers. They were invented in China, where they have been traced back to the 3rd century B.C.E. Hashi, chopsticks, with a naruto roll, which uses a cucumber wrap instead of seaweed. Photo Vasko Miokovic | IST. Domestic mackerel tends to be milder, less fishy than saba, Spanish mackerel.. Horse mackerel (aji) belongs to a different family. See saba. 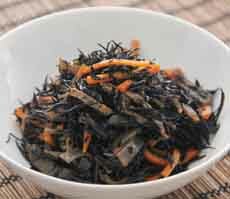 Black seaweed, which has the appearance of large tea leaves (tea leaves also can be eaten as a vegetable, but are not due to the expense). While often enjoyed as a salad with a vinaigrette (hijiki no nimono), hijiki can be made into a vegetarian sushi roll as well. Hijiki no nimono, a seaweed salad. Here’s the recipe. from Japanese Cooking 101. A mixture of spices for table seasoning. It typically includes black hemp seeds, dried mandarin orange peel, ground sansho pepper pods, nori seaweed bits, red pepper (togarashi), white poppy seeds and white sesame seeds. 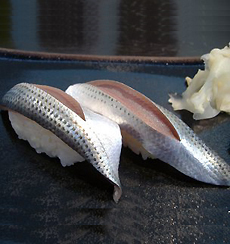 Silver-skinned fish (aji, iwashi, kohada, sanma, sayori, e.g.) sliced for serving, with the silver skin left on. (See photo at right.) One of the three types of sushi-dane, the type of meat (flesh) of the fish. The other types are red meat fish, such as tuna, and white meat fish, such as fluke. of Clare Kleinedler, Rainy Days And Sundays. Hirame is fluke, although it is often mistakenly translated as halibut (which is ohyo). While some people think that the thin, translucent piece of fluke, flecked with red, is one of the less expensive pieces of fish on the plate because it doesn’t have a lot of flavor, it is actually an expensive fish. The rippled fluke fin, or engawa, is popular with sushi connoisseurs. 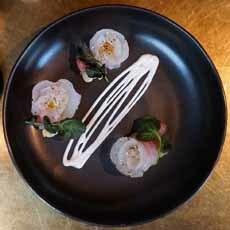 Fluke is sometimes arranged in the shape of a rose when serced as sashimi. Fluke roses. Photo courtesy Ozuku | NYC. Surf clam. Farmed in northern Japan and common to the arctic and the Northeast coast of the U.S. from Delaware to Maine, these sweet, attractive red and white clams appear frequently in sushi bars. Photo of surf clam at left by Maria Gritcai. Scallops. Spanish and Latin American cuisines also serve scallops raw, but they’re marinated in citrus juice and called ceviche. For sushi, the scallops can be served plain with wasabi, fried, or mixed with spicy mayonnaise. For sashimi, the smaller bay scallops are often served in a clam or oyster shell or scooped-out cucumber. Scallops are some of the most treasured sushi delicacies. with a rich, sweet taste and sink-your-teeth-in texture. Once you taste sweet, raw scallops, you may never cook them again! 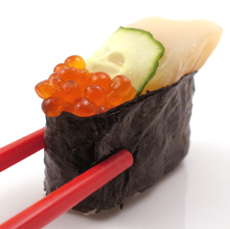 Sea scallops (hotate) with ikura (salmon caviar) and a slice of cucumber. Photo Jeannette Lambert | IST. Squid is one of the seafood items that is not served raw—it would be too chewy to be edible. It is blanched and scored before serving. Ika is pronounced EE-kuh. Squid legs, or the tentacles. These are tender and delicious, very different in flavor and texture from the body of the squid. It is unusual to find them at American sushi bars. Ika sushi is scored for tenderness, and is often served with a strip of nori between the fish and the rice to add color to the white-on-white combination. Photo | Sushi Connections. 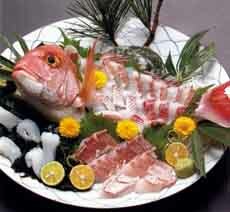 Iki zukuri, or live fish sashimi, is exactly that: You are served a fish live from the tank. Often the fish is carved live and reassembled whole, from head to tail. In New York City, live fish and lobster are served this way, and live octopus and live shrimp are also available. This is not limited to Japan and major world cities: We have seen a live lobster carved at a small Japanese restaurant in northern New Jersey. Salmon roe. 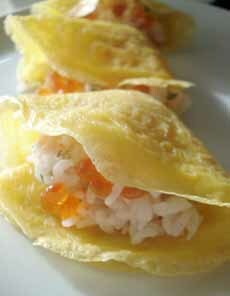 It derives from the Persian word for eggs, which became ikura in Russian and was adapted into Japanese. A fried, slightly sweetened bean curd (tofu) pocket stuffed with sushi rice and vegetables or other ingredients. The pocket itself is called aburage (photo at right). In Japanese, when the word sushi is preceded by a modifier, it is pronounced and spelled zushi. Here’s more information on pronunciation. The sushi chef (or any Japanese chef). 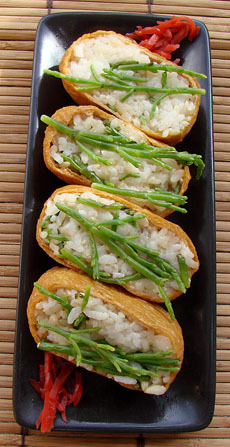 Inari stuffed with rice and garnished with sea asparagus (photo courtesy Sushi Seki | NYC).